So write Nick Freemantle and Suzanne Hill in their introduction to this important discussion on decision making in the reimbursement of pharmaceuticals. Based around a programme supported by the World Health Organization, chapters by leading academics involved in the research tackle such major issues as international pharmaceutical policy, tensions in licensing policies, priority setting, and relationships between the stakeholders. International pharmaceutical policy: health creation or wealth creation? Medicine and the media: good information or misleading hype? Evaluating pharmaceuticals for health policy in low and middle income country settings. Besides the controversial issues there is a wealth of practical information including economic modelling and the experiences from the WHO programme, providing readers with workable examples. This is essential reading for clinical researchers in pharmaceuticals and policy makers everywhere. 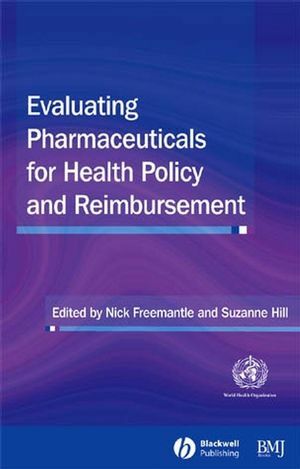 Nick Freemantle is the editor of Evaluating Pharmaceuticals for Health Policy and Reimbursement, published by Wiley. Suzanne Hill is the editor of Evaluating Pharmaceuticals for Health Policy and Reimbursement, published by Wiley. Development of marketing authorisation procedures for pharmaceuticals. International pharmaceutical policy - health creation or wealth creation?. The development of fourth hurdle policies around the world. Economic modelling in drug reimbursement. Priority-setting in health care: matching decision criteria with policy objectives. The tensions in licensing and reimbursement decisions: the case of riluzole for amyotrophic lateral. Relationship between stakeholders: managing the war of the words. Medicines and the media: good information or misleading hype?. How to promote quality use of cost-effective medicines. Making it happen and making it sustainable.